Powerful Phone Transfer Tool Lets You Seamlessly Copy Data Between Android and iOS. Transfer All Phone Contents from One to Another. Backup Your Phone Data to PC in One Click. 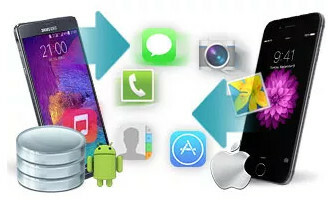 Restore Data to iOS, Android Phones in Lossless Quality. Support Different Mobile Operating System, like Android, iOS. Support Multiple Brand Phones, like Apple, Samsung, LG, HTC, etc. Addressed the issue where program failed to backup messages on device running Android 9. Fixed program disconnected issue when backing up data in some cases. One-click backup optimization and add the support for call history recovery on iOS 12. Fixed program crashing issue when recovering HEIC format photo to device in some cases. Optimize WiFi connection for Android device. Fixed an issue where program failed to transfer data to Android device. Fixed program failed to restore audio files to iOS device in some cases. Fixed program failed to read iCloud backup in some cases. Optimizations for iCloud backup downloading. Optimizations for Android device connection. Fix app crashing issue when loading data on Samsung Galaxy Note 3. Other performance improvements and optimizations. Optimize system prompts and some details. Improved program stability when restoring SMS to Android devices. Support downloading WhatsApp messages from iCloud backup. Fix program crashing issue when reading iTunes backup. Newly added support for Greek, Danish and Malaysian. Ability to backup and restore app data on iOS device. Ability to backup and restore Safari History on iOS device. Photo backup optimizations for iOS device. Optimized backup and restore speed for audio/video/photo files on Android devices. Ability to backup and restore HEIC photos. Add the support for WhatsApp on iOS devices. Contact and message backup optimizations on Android devices. Optimized the order of loading data on iOS devices. Resolved an issue that resulted in wrong MMS subject on Android devices. Fixed a bug related to photo location on iOS devices. Optimize Japanese fonts and some other details. Support for Android O beta. Support backing up and restoring contact group information. Ability to backup and restore message drafts on Android devices. Add prompt when connecting locked devices successfully. Add Restore from iCloud Backup feature. Add new features to Syncios.apk. Fix some Samsung devices detection issues. Syncios.apk supports Android 2.0 and above. Support restoring Notes to devices running iOS 9 and above. New transfer rules for trial version. Support unselecting contents when loading data. Optimize the display of Android device name. Support loading bmp and gif pictures in Android device. Fix some issues about Android SD card. Fix some bugs regarding iOS device. Fix program crashing issue when disconnecting the devices during backup and restoring process. Fix the interface anomaly issue when maximizing the installation window. Fix the program crash issue caused by Android connection failure. Fix the USB debugging permission keeps popping up issue. Optimize the interface of Syncios app when connecting. Optimize the process of contacts de-duplication. Fix Android device detection bugs. The Android codes are merged with Syncios Manager. Fix program crashing issue while loading Android data. Restore media and pictures to micro SD card with priority. Fix the bugs that Huawei Mate 7 failed to be detected when restoring calendar. Fix the picture loading problem in certain circumstance. Polish tooltip of setting default message app. Fix program crash issue while reading App data on HTC One E9. Fix some device detection problems. Optimize USB driver installation process for new device. Support backing up Android photo with its created date. Optimize the pop-up window on free trial version. Fix “0” fetched data issue in locked device. Optimize messages restoring speed on iOS device. Fix program crash issue while restoring call logs on Android . Fix incomplete display on feedback window. Support to restore SMS and Call log from iTunes backup files. Support to backup and restore Call log on iOS device. Add tutorial about turning on USB debugging mode on iOS 6.0. Fix SMS backup being wrongly deleted problem after restoring SMS . Fix SMS restoring failure issue on Android device . Optimize SMS restoring speed on iOS device. Support to select language during installation. Support restoring SMS on iOS device. Support restoring photos without clear up old conetent on iOS device. Support Android One Plus Phone. Support transferring SMS to iOS device. Disable backing up Apps on iOS 9. Fix program crash problem on Windwos 10 while loading data. Support to backup messages on iOS device. Fix some bugs regarding Android device. Fix setting backup path failure problem by default. Fix some bugs while running in Android environment . Fix some bugs on iOS section. Fix last name searching issue after restore on Android device. Fix compatibility issues on iOS 8.4. Fix accidentally stop issue while cleanning audios on Android device. Support backing up call log on iOS 8.3. Check option "Clear data before cope" to empty device data before data transfer. Calculate the remaining space after complete emptying device data. Reread the target device data after data recovery completed. Android data clear speed optimization, including contacts, messages, call logs and bookmarks. Fix HUAWEI and doov phone disconnect problem. Fix the issue that "Start Copy" button is unavailable in some cases. Fix the issue that audio transfer would stop at 100% in some cases. Fix some iOS problem. Functional optimization. Fix program crash issue associated with iOS SMS. Fix some iTunes 12 related pop up error. Fix program crash issue on Samung devices. Fix some Android calendar transfer problem. Optimize transfer speed on Android devices. Add the feature to transfer Android calendar. Fix more phones connection failure issue. Optimize flip devices function for better data loading. Optimized Android device driver download function. Fix program crash issue when roading photos on Android devices. Fix program crash issue when connecting devices to PCs running Win 8.1 system. Fix program crash issue if no photos in Photo Library. Fix Samsung Galaxy S4 connection failure issue. Enable to clear data on target phone before copy. Optimize program performance and stability. Reinforce the module of restoring from iTunes backup. Add testing before copy function. Fix interface display issue when selecting iTunes backup file to restore. Add the feature to analyze iOS device capacity and automatically remove duplicated files. Display registration and buy menu item on registered version. Fix some contacts display problems after transfer. Fix some crash issue and other bugs. Add undo and cancel operation to copy progress between Android devices. Add option to set opening backup folder automatically when backup completed. Display backup information, such as location, file size and more on the right side of backup interface. Fix the family name repeat display problem to iOS devices. Fix the backup loading problem after deleting a previous backup directory. Fix some pop-up dialog box interface problem. Add the feature to analyze Android device capacity and automatically remove duplicated files during transfer. Reduce memory usage on Android device when backing up SMS. Boost the speed to restore contacts. Optimize app installation failure tooltip. Fix the call log display error when there is no record on device. Add a Setting button in the upper right corner. Add a prompt window when the PC is not authorized on Android device. Fix the bug that certain field values of Android contacts are missing. Solve the date error that transferred from Android to some certain iOS device. Improve iOS device connection tooltip. Add option to set backup path location. Add tooltip to turn off iCloud when it's enabled. Add tooltip when the type of data cannot be copied to target device.